‍Decorated military veteran. Respected law enforcement officer. Multi-medal winning bodybuilder. Personal trainer. Loving husband. Devoted father. Loyal friend. Perfect life? Maybe. It was nearly 15 years ago, a day Ron will never forget. The then 33-year old, who worked as a Police Officer in the Tactical Unit with the Ontario Provincial Police, woke up with nagging flu-like symptoms, but proceeded into work as he had many other times with worse symptoms. Feeling light-headed and fearing he might pass out, he asked his partner to drive on that day. He made it through his shift, left his office and recalls driving home, but that’s it. Ron woke up in the hospital and remembers nothing in between. He was later told by his doctors that had he not received medical help when he did, in 10 minutes he would have been dead. Ron spent five days in an Ottawa hospital where doctors ran blood test after blood test with no results. A specialist from Toronto was flown in to assist. He immediately ordered a biopsy which confirmed the dreaded diagnosis he feared – Ron had lupus. And the bad news wasn’t over. His diagnosis was not a mild case, but rather the most severe case – Systemic Lupus Erythematosus (SLE). To make matters worse, he was also diagnosed with Discoid. SLE is typically the most common form of lupus and is generally considered more serious than the other three forms. It can affect many parts of a person’s body, including kidneys, heart, lungs, brain, blood and skin. Symptoms tend to vary among patients and can change often and suddenly. Although not limited to the SLE type, lupus can follow an unpredictable pattern of remissions (symptoms disappear) and flares (active symptoms). Discoid is a form of lupus that only affects the skin and causes rashes. These rashes may be anywhere but are usually found on the face, neck and scalp. This type of lupus does not affect any of the internal body organs although 1 in 10 people living with discoid lupus will develop systemic lupus. Ron grew up a Canadian citizen in the city of Montreal. After earning a bachelor’s degree in criminology, he relocated to Ottawa where he joined the Canadian Armed Forces and spent the next three years training in each facet of the military. He was then deployed to Desert Storm serving as a member of the Military Police. Ron believes his time in Desert Storm led to his lupus diagnosis. Gulf War syndrome, also known as Gulf War illness, is a chronic multi-symptom disorder affecting returning military veterans and civilian workers of the Gulf War. A wide range of acute and chronic symptoms have been linked to it, including fatigue, muscle pain, cognitive problems, rashes and diarrhea. From 1995 to 2005, the health of combat veterans worsened in comparison with non-deployed veterans, with the onset of more new chronic diseases, functional impairment, repeated clinic visits and hospitalizations, chronic fatigue syndrome-like illness, post-traumatic stress disorder, and greater persistence of adverse health incidents. During his military tenure, Ron had the opportunity to expand on his interest in nutrition and exercise eventually earning sports nutrition and physical exercise degrees. In addition to his role with the MP, he became his troop’s exercise and nutrition specialist charged with doing body assessments and then developing specialized eating and exercise regimens for each soldier. After three years of service, Ron returned home and became an Ontario Provincial Police Officer stationed in Ottawa. 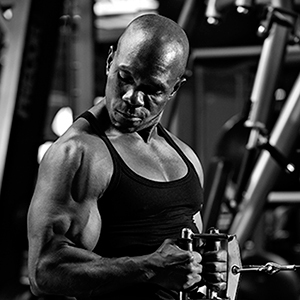 His passion for health and fitness led him to natural Bodybuilding, which means he trains completely Drug Free. Ron’s commitment to Drug Free training has inspired him to promote Natural Athletes, both locally and nationally. He has won multiple medals over the years at Natural Athlete competitions and has been a driving force in bringing these competitions to Denver. Since his diagnosis of lupus, Ron has refused all medication to combat the disease. Instead, he has countered it with a focus on physical exercise and diet control utilizing his extensive research and knowledge on how the human body works and what he is able to control. While he has been able to mostly manage his lupus, not using medicine has often resulted in more intense symptoms. Besides being devoted to his own training, Ron shares his extensive knowledge on nutrition and physical exercise with others as a fitness trainer. The long-time law enforcement officer, who now resides in the Denver area, also finds time to serve as a volunteer football coach at Denver West High School. Ron and his wife, Tiaja, met several years ago at a fitness and nutrition conference in Vegas, where Tiaja was competing. They have been married for 18 years and are the parents of three children. The couple organized and hosted a local Natural Body Building Regional Qualifier competition in Denver last fall. They held a silent auction in conjunction with the event with all proceeds benefiting Lupus Colorado, an organization and mission both are committed to growing. They have plans for a similar competition in the future.